We believe in marriage, believing it offers a wonderful adventure as well as great security! First, a civil wedding which once happened solely in a town hall, but now may take place almost anywhere. Till very recently these would not allow religious hymns, songs, or readings but now there may be "readings, songs or music that contain an incidental reference to a god or deity in an essentially non-religious context" (General Register Office publication). Secondly, weddings in Christian churches recognise God, as the source of love, the designer of marriage (Genesis chapter 2 verse 24), present to bless us as we gather in His name and at our side all our days. 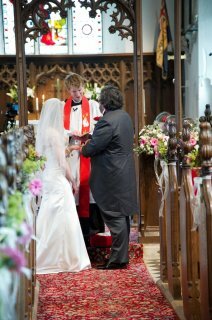 Anyone who lives in the parish may request a wedding at their local church, whether they are members or not. First, contact the Rector to make an appointment, when together you can discuss dates, times and your personal and contact details can be taken. Secondly, all couples take part in at least two evenings of marriage preparation, which are designed to give space to think how you can enrich and safeguard your love for each other as a couple, as well as sharpen up those communication skills, etc. This is done through video clips, case studies, studying the wedding service, considering what God in the Bible has to say about marriage, etc. Thirdly, guidance is offered in choosing hymns / songs, Bible and other suitable readings. Fourthly, you will be expected to pay the set wedding fees for the service, bells (optional), organist, wedding certificate, etc.